went on sale on Google Play. This unlocked phone provides a pure Google experience offering access to the latest and greatest apps including Google Wallet. Check out the Google Mobile Blog for more information. With the pre-installed Google Wallet app, you can easily make purchases and redeem offers with a tap of your phone. And when you set up your Google Prepaid Card, we'll also give you a $10 credit! In addition to the unlocked device, we are also excited to announce that Google Wallet is available on three new phones from Sprint, including: Galaxy Nexus, LG Viper 4G LTE and LG Optimus Elite. Google Wallet will also be available on the LG Optimus Elite from Virgin Mobile. Follow us on Google+ for the latest updates from the Google Wallet team! Today the unlocked Galaxy Nexus went on sale on Google Play. This unlocked phone provides a pure Google experience offering access to the latest and greatest apps including Google Wallet. Check out the Google Mobile Blog for more information. only comes once a year, but you can show the planet some love every day, starting with your own backyard. Today through Sunday we’re running a special Google Offer with online gardening retailer, AmericanMeadows.com: $5 gets you $10 worth of mixed wildflower seeds (more than 50,000 seeds! ), specially designed for Google Offers customers in honor of Earth Day. As a bonus you’ll also get two veggie or herb seed packs. Click here to buy this deal now! This GMO-free wildflower seed assortment includes twenty-five varieties of brilliant blossoms—like Cosmos, Poppies, and Hollyhocks—with both quick-blooming annuals for a splash of summer color and hardy perennials that’ll flower year after year. Not blessed with a green thumb? Don’t wilt; this mix is easy-to-grow and will flourish in all parts of the country, be it in a pot or in your garden. Head outdoors and plant something new! To subscribe to Google Offers, please visit: www.google.com/offers. And follow our Google+ Page for news and updates from the Google Offers team. Earth Day only comes once a year, but you can show the planet some love every day, starting with your own backyard. Today through Sunday we’re running a special Google Offer with online gardening retailer, AmericanMeadows.com: $5 gets you $10 worth of mixed wildflower seeds (more than 50,000 seeds! ), specially designed for Google Offers customers in honor of Earth Day. As a bonus you’ll also get two veggie or herb seed packs. Click here to buy this deal now!
. The extension helps you keep tabs on great deals from Google Offers as well as from our partners such as Gilt City, kgbdeals and zozi. 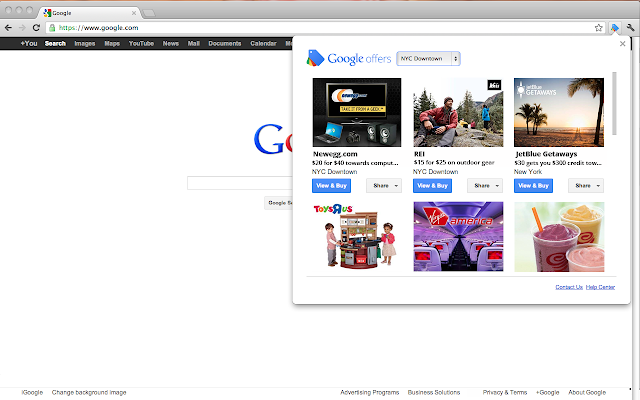 Download the new Google Offers Chrome extension today from the Chrome Web Store. After downloading the extension you’ll get instant access to deals for places to eat, shop and play, and you’ll receive notifications for new deals in your area right within your browser. You can also share your favorite deals with friends on Google+, Twitter and Facebook from the Chrome extension. Check out www.chrome.google.com/webstore to learn more and download the Google Offers Chrome extension. This Chrome extension is currently available in the U.S.
Today we are announcing the Google Offers Chrome extension. The extension helps you keep tabs on great deals from Google Offers as well as from our partners such as Gilt City, kgbdeals and zozi. More than 167 Walgreens and Duane Reade locations in New York City now accept Google Wallet -- making it even more quick and convenient to shop and save at your neighborhood drugstore. To get this Google Wallet Featured Offer, simply open the “Offers” tab in the app, touch “Find Offers” and save the LISTERINE® POCKETPAKS® offer to your Google Wallet. And that’s it! The next time you tap to pay at a participating Walgreens or Duane Reade location, this offer will be automatically redeemed and you’ll be on your way to fresher breath! Check back in May to see more Featured Offers from Johnson & Johnson Healthcare Products Division of McNEIL-PPC, Inc for products available at Walgreens and Duane Reade stores in Manhattan. In addition to Walgreens and Duane Reade, Google Wallet, available on select phones, is accepted at 150,000 merchant locations in the U.S. via the MasterCard PayPass network. *This offer is only valid for redemption with Google Wallet via NFC while supplies last. Limited quantities available. Offer is good through April 28, 2012. Not valid on paper or on phones that don’t support Google Wallet. Single use only and non-transferable. Select stores located in Manhattan. announced a debugging dashboard for the Content API for Shopping that we created based on feedback from our merchant partners. Today we’re introducing two more features for the Content API for Shopping that many of you have requested: the Data Quality feed and the User Management feed. We hope these features make it easier for you to manage your product feeds and drive better results from Google Product Search. Please keep the valuable feedback coming! It’s no surprise that some of the best ideas for improving Google products come directly from you, our users. In February, we announced a debugging dashboard for the Content API for Shopping that we created based on feedback from our merchant partners. Today we’re introducing two more features for the Content API for Shopping that many of you have requested: the Data Quality feed and the User Management feed. , revealing hidden talents and soaking up the Boston culture without burning a hole in their wallets. We’re keeping the great deals coming with an entire week of offers that embody the true flavor of Beantown. Figs: One of Todd English’s acclaimed restaurants in Charlestown, Figs is celebrated for its thin crust, wood-fired pizzas as well as its handmade pastas and homemade desserts. This casual bistro is a no-brainer when it comes to choosing a place to dine (and with all the gems in Boston, we know that isn’t always an easy choice). Captain John Whale Watching and Fishing Tours: Visit historic Plymouth for more than just the Pilgrims and the Rock. With Captain John Whale Watching and Fishing Tours, you’ll cruise alongside the most rare, massive mammals in the world. The kicker? Whale sightings are guaranteed! The Elephant Walk: “Flat out delicious” according to Zagat, this award-winning restaurant serves up an unexpected combination of Cambodian and French cuisine. With the arrival of baseball season, you’ll be happy to discover it’s located just a short (elephant) walk from Fenway. Old North Church: The Old North Church helped spark the American Revolution when Robert Newman climbed the steeple and held out Paul Revere’s signal that the British soldiers were leaving Boston. The oldest standing Church building in Boston, the Old North Church is one of the top historical destinations for tourists and Bostonians alike. Viking Princess Cruises: As much as we love Boston, sometimes you need to get away. Escape to the Cape and board the 40-foot Viking Princess, which cruises a coastline that’s seen its fair share of shipwrecks, pirates, pilgrims, and whalers. This narrated journey reaches the very tip of Cape Cod, home of the scenic Long Point Lighthouse—it also happens to be as far east of Boston as you can get without ending up in the Atlantic. To subscribe to Google Offers in Boston and other locations across the U.S., please visit: www.google.com/offers. And follow our Google+ Page for updates from the Google Offers team. Thanks to Google Offers, Bostonians have been taste-testing menus, revealing hidden talents and soaking up the Boston culture without burning a hole in their wallets. We’re keeping the great deals coming with an entire week of offers that embody the true flavor of Beantown. is running its first deal with Starbucks. For $5 you’ll get a $10 Starbucks Card eGift, good at all participating Starbucks locations nationwide. This deal is only available to Google Offers subscribers. , a payment service that makes it possible for people to redeem discounts, earn loyalty points and pay—all at the same time, whether they’re shopping online or at the store around the corner. Today, we’re thrilled to announce that we’ve acquired payments technology company TxVia to complement our payments capabilities and accelerate innovation towards our full Google Wallet vision. TxVia is a technology pioneer that offers a fast, flexible and highly reliable payments platform—which we believe is one of the best in the world. Since 2008, TxVia has supported the management of more than 100 million accounts. They’ve partnered with the industry’s best known brands, and their leadership team has played an instrumental role in defining the fast-growing prepaid card segment of emerging payments. In this time, TxVia has also certified and directly connected to the major payment networks, which establishes a solid foundation for Google Wallet and our partners to drive innovation on a global scale and in a partner friendly way. Finding and purchasing products is a big part of day-to-day life. At Google, we’re working to create new ways to improve the commerce experience. We’ve worked closely with TxVia over the last year, and they’re a forward-thinking team that will help us take the next steps in realizing the future of commerce. We welcome the TxVia team to Google. Over the last year, we’ve been hard at work developing Google Wallet, a payment service that makes it possible for people to redeem discounts, earn loyalty points and pay—all at the same time, whether they’re shopping online or at the store around the corner.